Gerrit van Veen runs the recycling company together with his father Riekelt van Veen. They were introduced to the recycling market by grandpa Gerrit de Vries in 1995. “Polystyrene recycling was a new phenomenon at the time, and my grandfather saw it as an opportunity. So even as a young boy, I was right in the middle of it – and I thought it was fantastic”, explains Gerrit. De Vries began with a polystyrene compactor, and soon many of Urk’s fishing firms found their way to him to help them process their polystyrene fish boxes. In 2014, De Vries took the next step and began extruding EPS. Today, the polystyrene is processed into General Purpose Polystyrene regranulate, which is sold to the plastics industry. Today, the raw materials are provided by a wide range of suppliers, not just the Urker fishing industry. De Vries Recycling strives for quality, reliability and long-term partnerships. Thanks to that vision, De Vries Recycling has grown to become an international player in the EPS market. Solar power is the conversion of energy from sunlight into electricity. Using this inexhaustible energy source is in line with our circular vision and will reduce the carbon footprint. 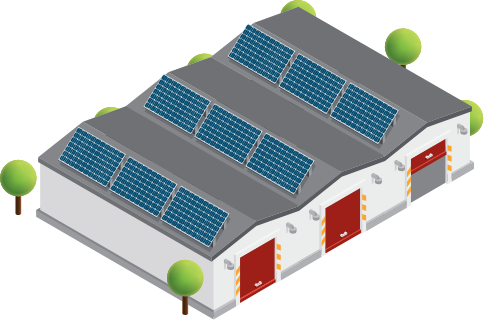 The installed sun panels are producing in average 80.000 kwh per year. This is enough energy to provide annually 20 households.